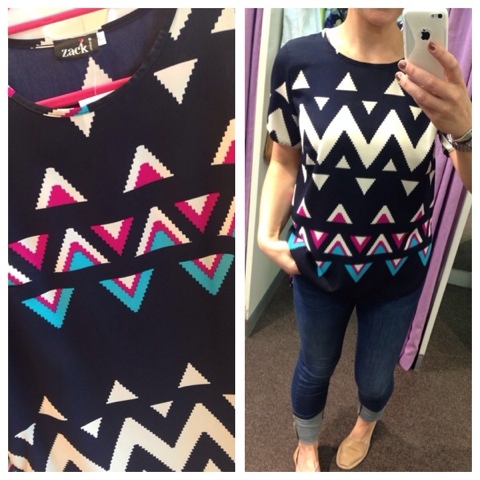 For my second Local Hero post, I'm going to tell you all about a new boutique in Lisburn. 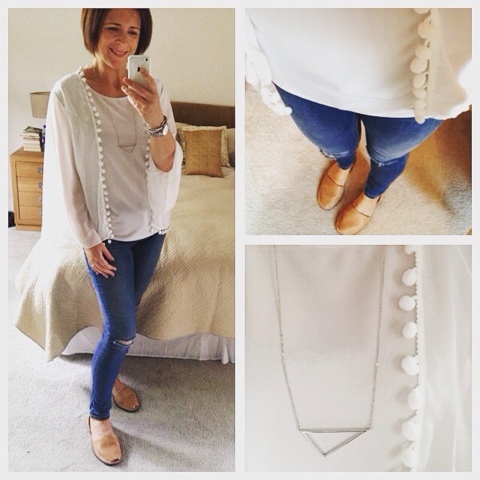 I first met Danielle, the owner of The Style Retreat, at a blogging event a few years back. Danielle had a busy corporate career and a blog over at The Yellowest Diamond but she always had a dream to be her own boss. 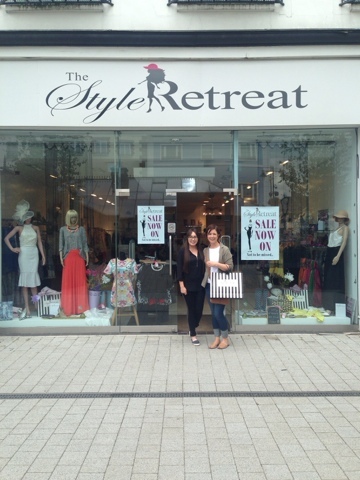 A few months back, she took the plunge, left her job and within weeks, opened up The Style Retreat in Lisburn Square....I remember at the time being so impressed and a little bit envious of her! I made my first visit to the shop a couple of weeks ago and I'll be honest, Danielle is younger than me and super trendy so I was afraid that her stock would be too young for me and my school run. But I wasn't disappointed. Yes, she has lots of trend-led pieces in the store as a big part of her market is the 20/30'something girl. But Danielle has managed to weave in pieces that are also completely wearable for any age group, as well as a great accessory & shoe range. I've learned anything in my years of blogging, it's to venture into shops that you've never tried before....it can give your wardrobe a real lift. So here's the photo heavy try on session which I hope gives you a sense of the range in the shop and also, check out how many things she actually had for this 40+ mamma...pretty impressive for a relatively small shop unit. And I should point out now that Danielle can post any items out - contact details at the bottom - and her website will be live very soon. In fact, I can reveal now that I will be doing a giveaway with her when the site launches...watch this space. 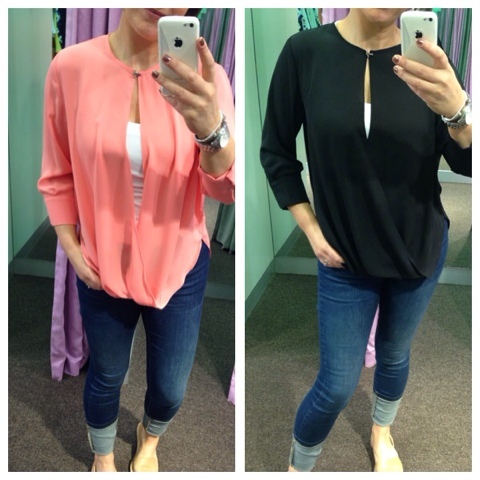 First up - these cross-over blouses were so flattering to wear. They give all-important coverage on the arms but have an open front and back. I had a white vest of my own underneath but I think for the black one, a sparkly black cami or vest underneath would look great on a night out. 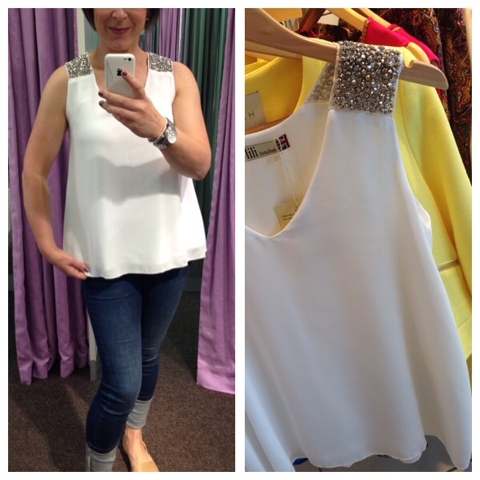 Next up, this sparkle shoulder vest top was fab on...double layered so it wasn't see-through. 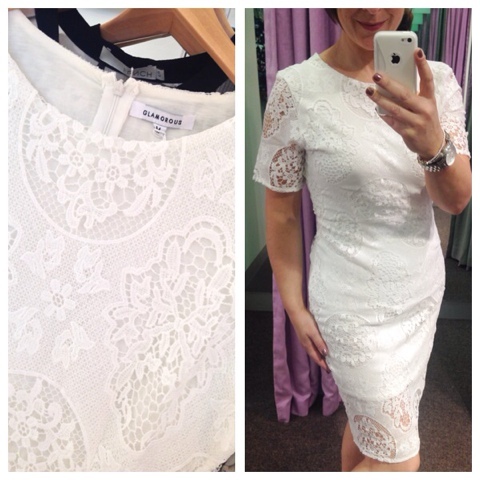 I shared this dress on Facebook - it's cream lace in a super flattering length (with sleeves) but with a shorter mini skirt underneath. The perfect way to show a bit of leg in a subtle way. I think this would look as good with a denim jacket and sandals as it would glammed up on a night out or at the races. 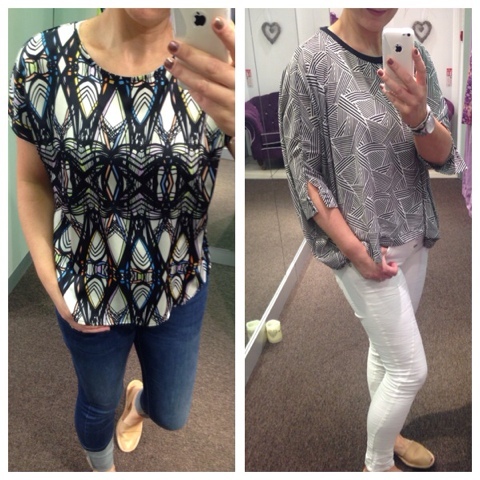 A couple of tops that I tried on - both working the geo trend and both very wearable. I also tried on some cream jeans - I'm still looking for my perfect pair of cream jeans and sadly these were a bit low cut for me. This top almost came home with me. I love the aztec print and the fact that it's got a longer back..
and as for these glitter slip-on trainers....I was gutted that they were out of stock in my size. I'm wearing the 7 and it was just too loose :( gutted as they are the perfect neutral sparkle colour and would match so much! 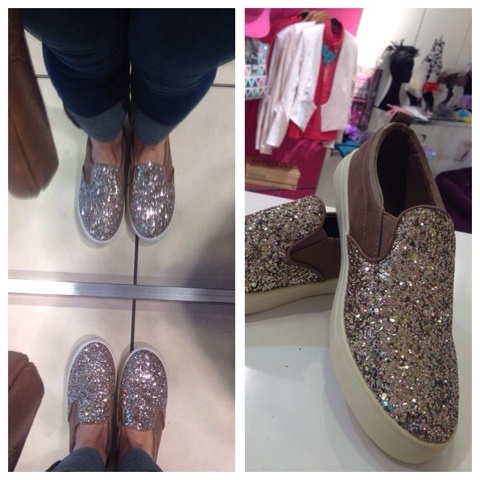 But I quickly got over the lack of sparkle trainers as I found a couple of pieces to come home with me. For me, this yellow jacket was the stand out piece. This jacket is almost identical in material and styling to the Zara coat I dithered over buying a year or so ago. 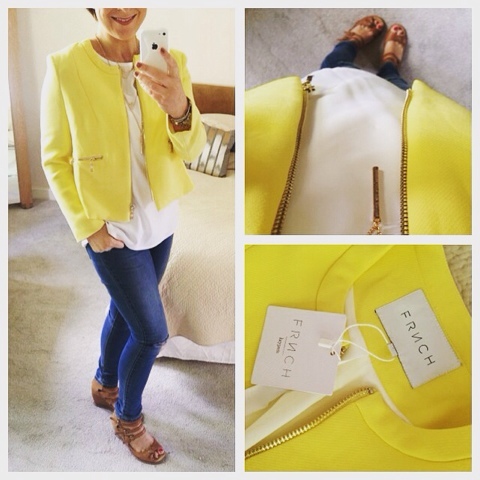 At the time, I found the coat too much but this jacket is perfect - enough yellow to make me happy but not so much that I feel like a beacon :) It's worked really well as part of a daytime outfit and I know it will be brilliant with all black on a night out too. There were a few in stock when I bought mine and it retails at £60, which I felt was a great price as it's a good weight and fully lined. I also fell in love with this cream sheer kimono. It was the pom-poms...they get me every time! I think it was the last one in stock though - but if you're interested, drop Danielle an email. It was £28. Congratulations Danielle - you're the second School Gate Style Local Hero! 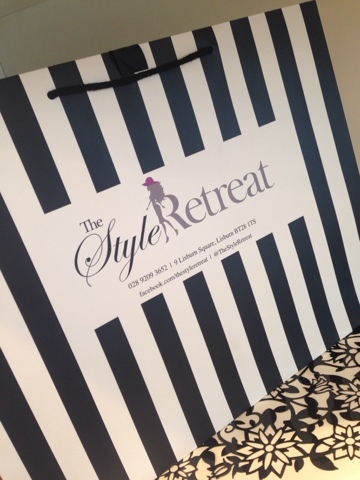 If you would like to contact Danielle about anything you've seen on this blog post, you can email on hello@thestyleretreat.com, call the shop during working hours on - 028 9209 3652 or leave a message on The Style Retreat's Facebook Page on this link. Disclaimer - I was given a discount on my purchases. Thank you Danielle and thanks to you for supporting the brands that support this blog. Some lovely pieces there Avail, and love your selections especially the yellow jacket you'll be suprised to hear! Will definitely pop in when I'm over that direction next.